Following weeks of rumors, Apple (S AAPL) just made it official and announced the acquisition of headphone maker Beats Electronics and its Beats Music digital music subscription service for $3 billion. The acquisition is made up of a $2.6 billion purchase price and an additional $400 million that will vest over time. Apple is expecting the acquisition to close in the fourth quarter of this year. Apple hasn’t said yet how it is going to integrate Beats into its company, but Cue’s remarks hint at the possibility of running Beats Music as a separate subscription service that complements, and not replaces, iTunes digital downloads and the Pandora-like iTunes radio offering. 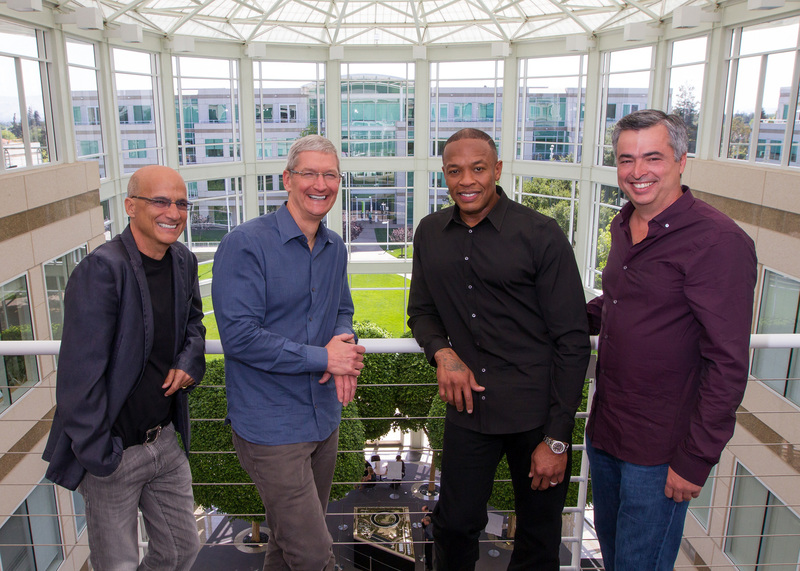 Jimmy Iovine, Tim Cook, Dr. Dre and Eddy Cue. Beats Music is arguably a smaller part of the business, with an estimated subscriber base of 200,000 and a total of $120 million in funding. Beats Electronics, on the other hand, sells an estimated $1.5 billion in hardware per year. The acquisition of Beats Music has nonetheless the potential to radically transform the digital music business. The New York Post had reported earlier Wednesday that Apple was able to cut the purchase price of Beats to $3 billion, slightly down from the $3.2 billion that the Financial Times had reported earlier this month. Beats Electronics Founder and CEO Jimmy Iovine, who will join Apple as part of the acquisition with his business partner Dr. Dre, is scheduled to go on stage at the Code conference later this afternoon. We will be covering his on-stage interview on Gigaom. So, HTC deal is no more?